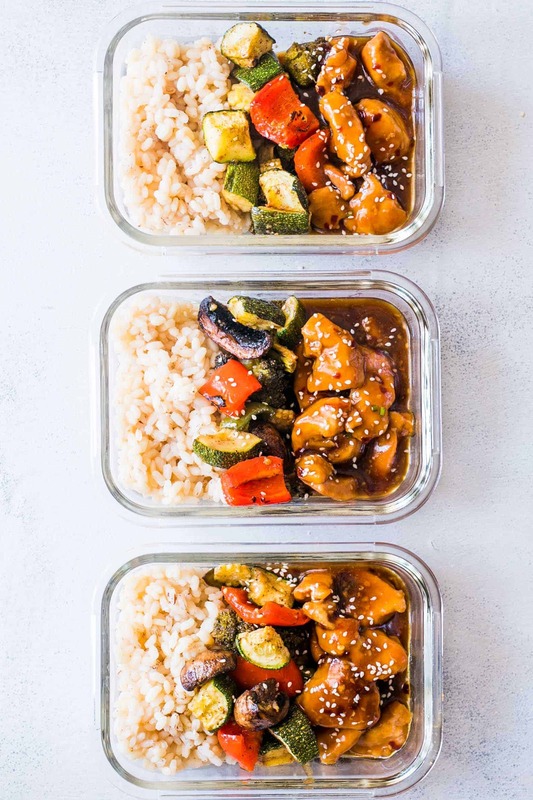 Tasty Teriyaki Chicken Stir Fry Meal Prep Lunch Boxes are the easiest way to make sure you are ready for the work week ahead. Served with brown rice and grilled vegetables, it’s a balanced meal! It’s Fridaaaaaaay and am I glad that this week is over. It started with nothing major going on and then exploded into a super crazy week! Which also happens to be the story of my life. But I realised that we were so unprepared. I was trying to juggle between work, cleaning the house and trying to make sure I had something to eat for lunch every day. I don’t know what its about working from home that you forget your own meals. I do that every.single.day. And it’s not a great feeling when you suddenly realise that you stomach is growling and you don’t even have leftovers in the fridge. And all this in spite of the fact that I’ve been making these fun lunch boxes for the sister. So I’ve decided to meal prep ahead. With these super yummy teriyaki chicken stir fry meal prep lunch boxes. Which took me exactly an hour to put together and I now have four lunch boxes ready! I’ve been loving the whole teriyaki thing since I made this super quick teriyaki shrimp broccoli stir fry a while ago that you all loved so much! Which you can also use for these meal prep lunch boxes. 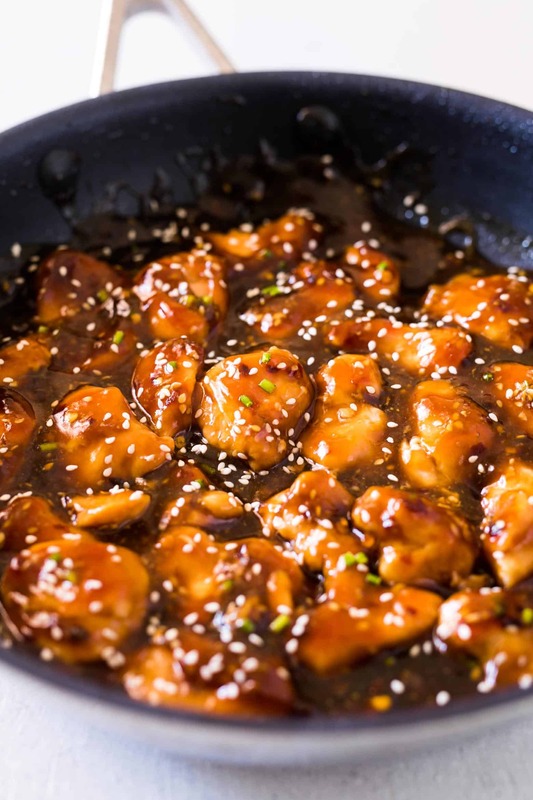 It’s so easy to make your own teriyaki sauce at home with simple ingredients like soy sauce, honey, chilli flakes, ginger, garlic and some cornstarch. 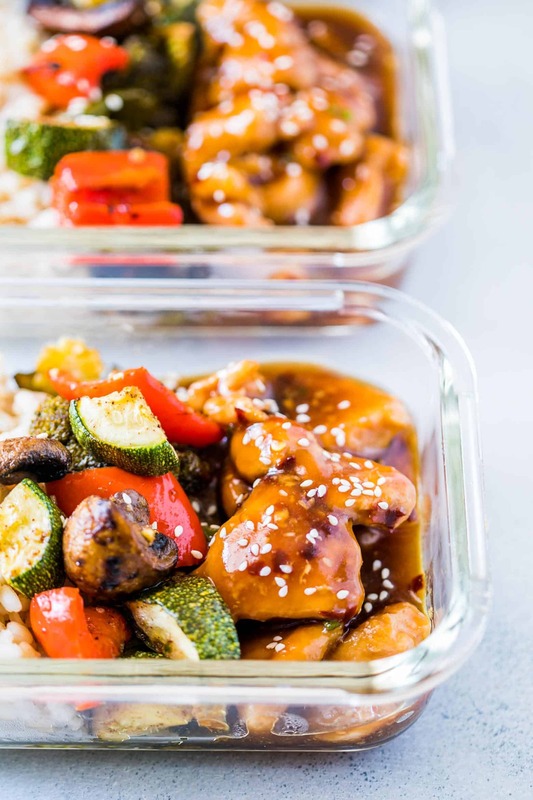 And that’s why these teriyaki chicken stir fry meal prep lunch boxes are also clean eating with ingredients that you already have in your kitchen pantry. Now if you’ve never done meal prep before, it’s super simple to do. How do I meal prep these teriyaki chicken stir-fry lunch boxes? Being prepared or making meal prep lunch boxes is really easy. You basically triple or quadruple one serving size and get everything ready – the protein, veggies and carbs which in this case is saucy teriyaki chicken that has a finger licking sauce, roasted vegetables simply tossed in olive oil, salt and pepper and boiled brown rice. You can swap the rice for quinoa, noodles or anything else you like. What containers can I use for meal prep lunch boxes? This is super important because you need containers that are refrigerator/freezer safe and microwaveable. Because you will probably carry them to work and just pop them out of the fridge and into the microwave. I love these glass containers with lids. But if you don’t like glass or want something lighter, these reusable containers are pretty great as well. Have I got you excited about meal prep? Because there is more where that came from! I wish I could give you some kind of money back guarantee because that’s how good these teriyaki chicken stir fry meal prep lunch boxes are. This recipe looks delicious and I plan on making this for our lunches next week. When you say vinegar though, what type of vinegar? Is rice vinegar ok? Or should it be a different type? Hey Michelle – yes, rice vinegar works! Okay these were soo good!! Super easy to make, and it has so much flavor!! So is the rice okay to keep in the fridge all week? And to reheat each day? Or it it best eaten cold? Yea, rice can last in the fridge for a week, so you can reheat it and eat it. Hey Deb, I’ve never tried freezing these so I can’t really say. But you can probably cut the recipe in half if you prefer small portions. Thanks Sara – so glad you liked it! Oh, this was divine. I was looking for something new for lunch and stumbled upon this recipe. I’m so glad I did! I wasn’t sure what “garlic paste” was, so I just threw veggie oil, a ton of garlic, salt, pepper, and a little lemon juice in with the garlic. Drank the sauce? I may have done that at times too 🤣 Garlic paste is just a ton of garlic that I grind to a paste and refrigerate or freeze. It makes prep really easy. Can I use ground ginger instead? If so, about how much? Hi! Thanks for sharing the recipe. 🙂 I tried it last night and I must have waited 20 (30? I was prepping several things at once lol) minutes for the sauce to thicken, but it never did. Just cubes of chicken in Teriyaki water. Should I try reducing the water next time? Was it supposed to be 1.5 tablespoons……? Thanks! Hey Jessica – thanks for letting me know. That’s really strange because the cornflour should thicken the sauce. I’ll retest the recipe and let you know if you need to make any changes. Thanks for trying. Thanks for your feedback Lexi, I’ll retest the sauce and see if it needs any changes. Hello! thanks for this recipe. I have a question. How long do you microwave it for the reheat?? And how to prevent the rice from being dry due to reheat? Thanks! Hello! This looks delicious! One question – to marinate the chicken in the garlic paste, do I simply put 1 tsp of garlic in a bag with the 1lb of chicken?? The proportions seem off. Thanks! Hey Stephanie! I basically pound the garlic into a paste and then use it to marinate the chicken but you can easily use minced garlic and rub it all over the chicken. Do you have the macros on this meal? No I don’t but you can easily input the ingredients into myfitnesspal and it’ll throw up the nutritional information. Can’t wait to try this out next week! Can you provide clarification as to what you mean by “garlic paste”? Is this something that is store bought? Thanks! Hey Brittany, you can just use minced garlic here! My pleasure! I’m looking forward to trying more of your recipes! So yummy! I can’t wait to make it! This is brilliant and obviously, this picture of the recipe makes me hungry. I will bookmark this recipe and after making it I will share my cooking experience with you. Thanks, thanks a lot. Rice Vinegar works best Kylie! Pictures are absolutely drooling and tempting. Great Photography! And thank you for sharing the recipe. this is a fantastic idea for lunch. im going to try this next week!